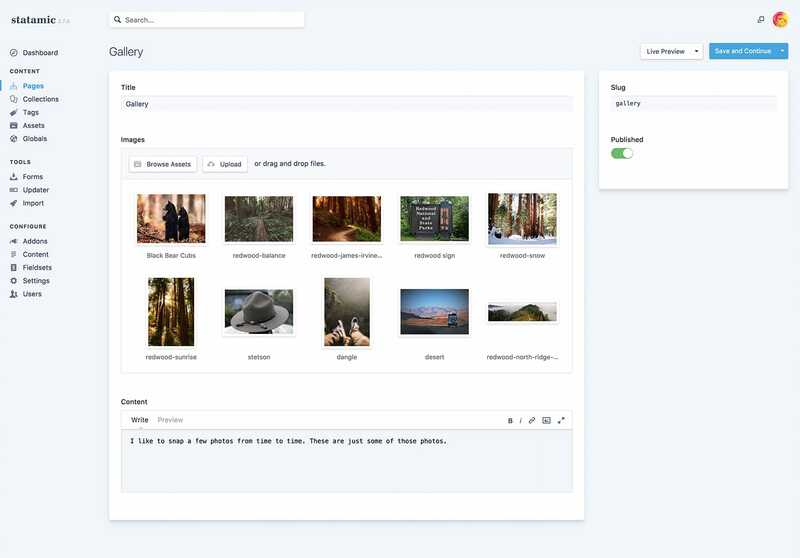 Statamic cuts out the database and creates a faster, more productive way for you to build, manage, and version control beautifully creative, bespoke websites. It seems like everyone else does. If you’re looking to just plop a generic theme on the internet and replace a few text blocks with your company info, then yes, maybe you should just use WordPress. But if flexibility and ease-of-use is important to you, keep reading. Statamic is much easier to customize, without extra fields and confusing areas you need to be trained to ignore. A Statamic Control Panel is perfectly tailored to your exact content. While WordPress itself is free, the total cost to build and run a WordPress site isn't. You'll probably need to buy Advanced Custom Fields, a backup utility, a forms module, search plugin, and a better caching system. All of those features (and more) are included in Statamic core, and are maintained by the core development team. Overall, Statamic has a much lower cost of ownership than nearly every other CMS. And then there's security. An estimated 90% of hacked sites online are running WordPress, and those hacks happen on mostly up-to-date installs. It's the most targeted and vulnerable CMS on the internet today. It's built on an old code base whose plugin system leaves it consistently open to attack. If you don't have a developer dedicated to keeping your site up to date, you are vulnerable. Emergency developer support to bring your site can be expensive, as can lost business from an offline or broken site. Statamic is built on Laravel, the most modern, powerful, and secure PHP framework ever created. Statamic includes most (if not all) of the features you would normally need a pile of paid WordPress plugins for. If you want to take your website to the next level quickly, cost-efficiently, and securely, then Statamic is for you. What's so great about flat files? Instead of requiring a database you can neither touch nor version control, Statamic stores all of your content and configurations in files. Text files, Markdown files, YAML files, and so on. You can see them, touch them, edit them in any editor of your choosing, and even email them to a friend for editing. Combine these files with HTML, CSS, and our Antlers template language, your site comes alive with possibilities. Content lives in files. You can manage everything without the Control Panel if you want. 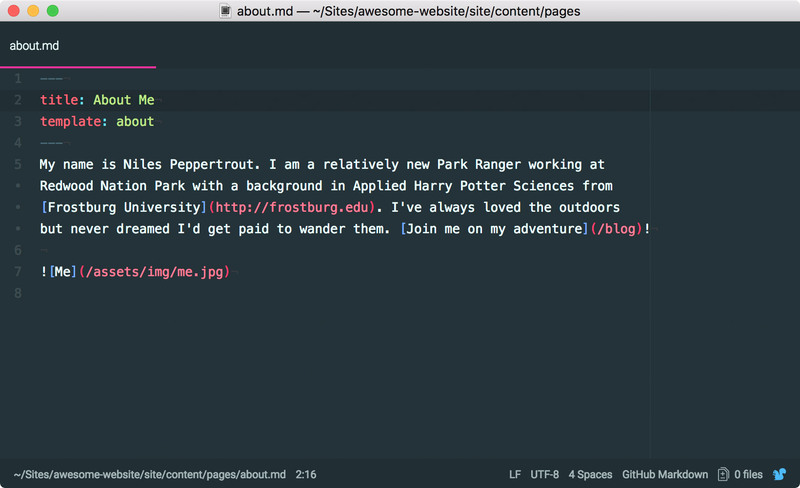 You can find & replace content across your entire site, write in your favorite text or code editor, or even GitHub. Duplicate a site & instantly jumpstart your next project. Scaffold out your content model as you go. There is no need to create schemas ahead of time. You can do that later. Staying in sync with a live site is pain-free with version control. You can automatically commit content changes with git. Send an entire site in a zip file and it'll run on just about any modern PHP server. It’s the best tech of today married with the simplicity we all miss from 1999. Not only that, but the structure of relational MySQL databases present scaling challenges. Sites can be difficult and expensive to manage and load balance. Some of the Moz Top 500 sites now run on Statamic after struggling on other platforms. Statamic's flat file structure hooks into NoDB environments with little effort. Can they learn Statamic quickly? Statamic is notably easier to use than WordPress and many other popular CMSes. Start in your site tree (or customized dashboard), explore your pages and entry collections, and write, edit, and publish all from any device you own. Statamic is used by hundreds of journalists at top news organizations like Der Spiegel, little ma-and-pa local companies, and everything in between. Statamic's Control Panel is flexible, intutive, and pleasant to look at. 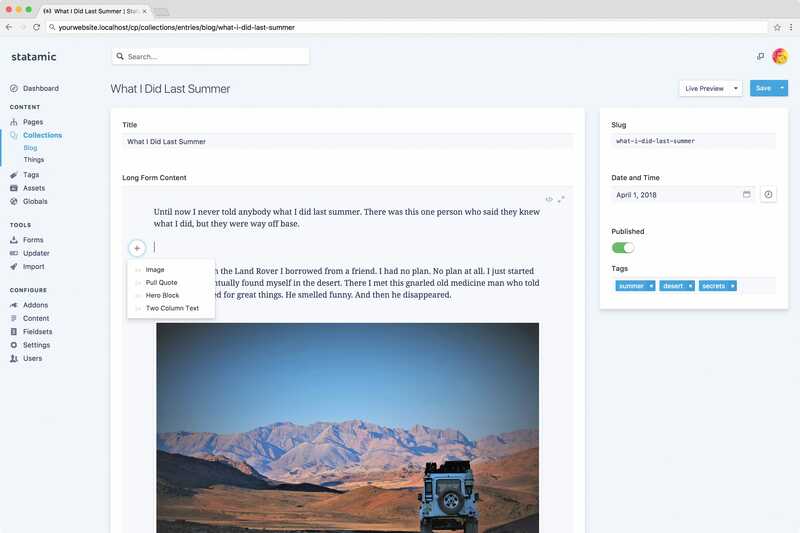 Combine rich text fields with switches, repeating blocks, select boxes, image uploaders, related posts, text boxes, checkboxes — you name it — and craft the perfect tailored control panel experience for your team. They will love you for it. No bloat, no fields that do nothing. No need to abuse “Categories” or other features just find a way to get text onto a page somewhere. Your life will be simple again. Can Statamic manage forms? Or do we need to pay for a 3rd-party form addon? We believe the most common features of a website should be included and part of the core CMS product. Statamic forms collect, report, and even display user submitted data on your site. 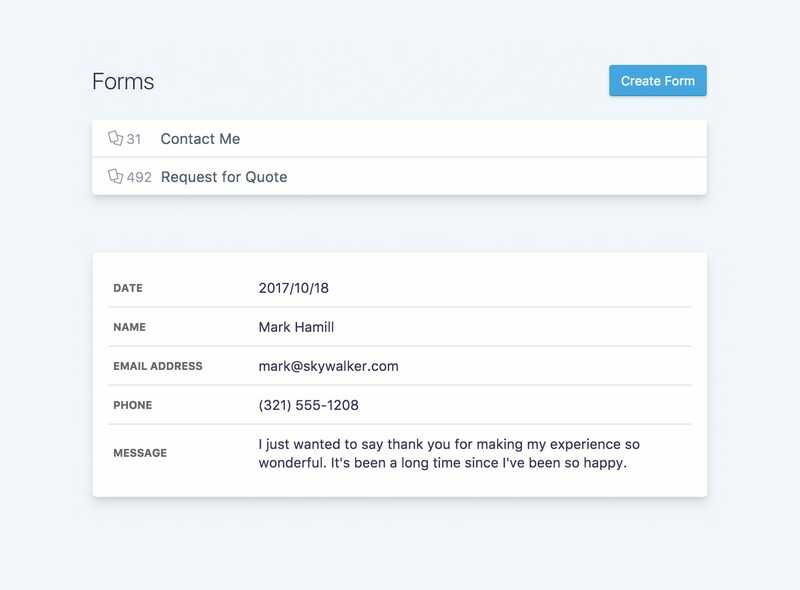 Manage unlimited forms and connect them to Mailchimp, HubSpot, or anything you want. You can even export the form data to Excel-compatible .csv files, set up reporting metrics and formulas in the Control Panel, and manage/delete submissions. There's very little Statamic can't do. We have a photo-centric magazine-style site. We need a lot control over our images. We love those kinds of sites. Statamic's Asset Manager will knock your socks off. Not only can you see all sorts of meta data on your assets, preview videos and various document types, but you can customize fields to manage content globally around your assets. Write that alt tag once and forget it forever. And it gets better from there. Setting focal points keeps your photos compelling, no matter the crop. 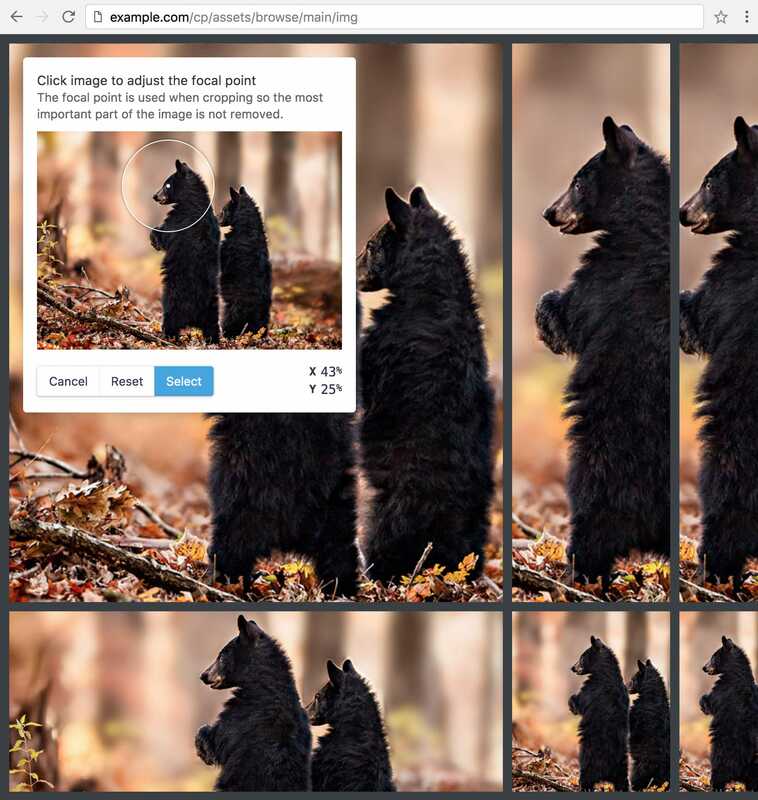 You can rename, move, resize, crop, filter, alter, and manipulate your images to heart's content. We even have a focal point editor, ensuring the most important parts of your photos stay in frame, no matter what dimensions your image is manipulated into. Can we manage different translations? Absolutely. You can translate your site into any language, no addons or extra modules required. Simply add a new locale and keep on rolling. Statamic is multi-lingual at its very core. Translate to any language, and even have different site structures per locale. Thousands of companies, from large news organizations and Fortune 500 companies, to web design agencies, and hobby bloggers. We're pretty sure you've heard of some of them. This all sounds really nice, but why isn't it free? WordPress is free. Free software needs to make money somewhere. Have you wondered how free platforms stay in business? Perhaps they charge you for that one feature you didn't realize wasn't included. Or maybe you need to pay to ask a question, or need to use a special high-cost server, or your traffic is limited or throttled, or they own your data. When you're not paying for the product, you never know what external funding decision might affect your own business. Statamic runs on your own server. You own your site forever, and you can run Statamic indefinitely without having to pay another penny, peso, or rupee. With Statamic, you simply pay for the software itself and get all features. No gimmicks or games. Ask us a thousand questions and we'll give you a thousand answers. Stay up to date with one-click-updates and get the latest features in a few seconds. We sell it commercially for a price and use the money to fund development and support. We have a simple business model. What about addons, plugins, themes, and all of those things? Let us introduce you to The Marketplace, the one-stop shop for addons and themes. It's a full blown community of designers, developers, and business-minded folks. The Marketplace enables developers to easily share or sell their hard work without having to worry about setting up their own store. Everybody wins. Can we try it before we buy? Yes, you sure can. We'd love it if you did. Use Statamic for free in your dev environment as long as you'd like.